For Oz Comic-Con here in Melbourne, Stomping Ground Brewery teamed up with comic artist Wayne Nichols (Marvel, Dark Horse, and more) to produce a three-part comic told over three different cans. 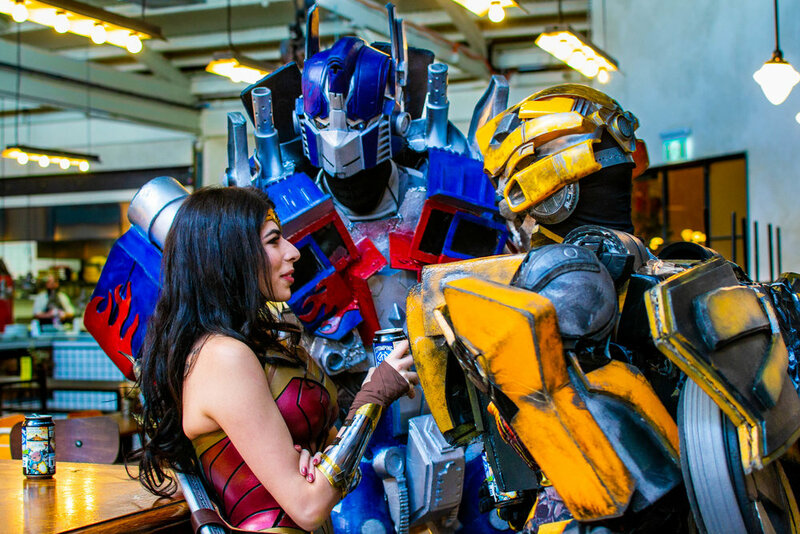 The first was launched in the lead-up to the convention (which was held June 9-10), and the brewery roped in a few friends—Wonder Woman, Optimus Prime, and Bumble Bee—to help celebrate the occasion. Inside the cans is Stomping Ground's Laneway Lager, and the story wrapped around the container tells the tale of a mysterious heroine emerging from a Melbourne laneway to save the city from an alien attack. The beer pops with fresh New Zealand hop flavor, but the fate of the city? Well, we'll just have to wait and see. The story continues over two more cans to be released for the Brisbane (Sept 22-23) and Sydney (Sept 29-30) conventions.